The Making Of: The Eclipse Motorcycle Jacket from Aether Apparel on Vimeo. Inspired by SPIDI’s renowned custom MotoGP gear and a shared appreciation for both technical performance and design, Los Angeles apparel company AETHER teamed up with the Italian motorsport brand to create the Eclipse Motorcycle Jacket. Designed by AETHER and constructed by SPIDI, the collaboration has resulted in a jacket that combines a refined modern aesthetic with the finest in old-world leatherwork. Made with a premium leather shell and yarn-dyed cotton lining, the Eclipse uses handselected natural materials that have been prepared in traditional Italian fashion. Box quilting on the upper torso and arms offers a subtle nod to vintage styles of the past, while the clean lines and piecing lend to the jacket’s distinctly modern look. For protective padding, AETHER incorporated SPIDI CE-certified armor into the elbows, shoulders, and back. These low-profile, shock-absorbing pads have a multilayer construction that progressively dampens and diffuses the force of a sudden impact. The pads have been cleanly integrated into the jacket’s lining, but can be completely removed if desired. During the on-bike fit sessions, AETHER went to great lengths to increase joint articulation while eliminating pinch points. The Eclipse, therefore, features ergonomically shaped shoulders and sleeves to allow for a natural, comfortable fit while seated in the riding position. Stretch ribbed panels have been added behind the shoulders for increased range of motion, while the shaped bottom hem allows for extra coverage while leaning forward on the bike. For quick-access exterior storage, the Eclipse has a zippered Napoleon chest pocket and zippered front hand-warmer pockets. On the interior, the jacket has a zippered pocket for more important items. Zippered cuffs allow you to adjust for riding with gloves. 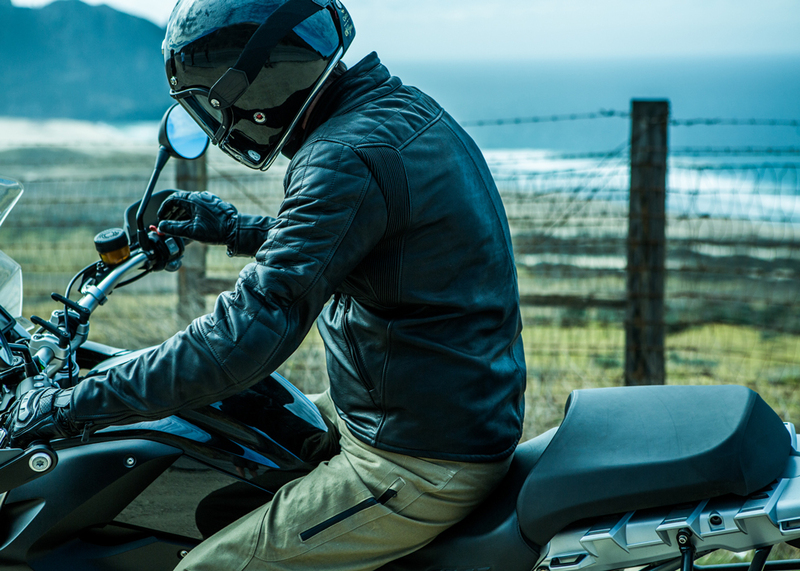 With its rugged yet refined style, advanced protective padding, and Italian motorcycle racing pedigree, the Eclipse is designed to be the showpiece of any urban rider’s wardrobe.